[ScarletExplains] Moon Prism, GIRL POWER! Scarlet Rhapsody > Editorials > [ScarletExplains] Moon Prism, GIRL POWER! Right wrongs and triumph over evil! 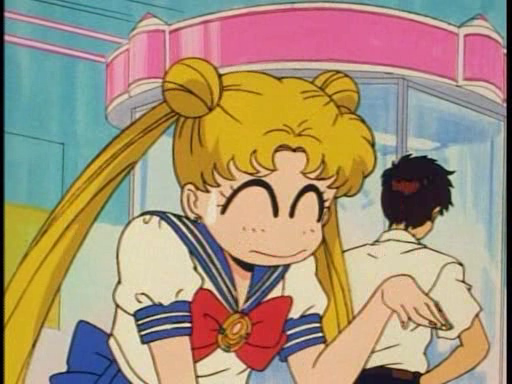 I’m sure by this point, every Moonie has seen Nostalgia Critic’s review of Sailor Moon. While we can nitpick his analysis and talk about how the original Japanese version is “ten times better,” the Critic points out a recurring theme that I see in what people have against Sailor Moon. At Anime Expo, one attendee at an academic lecture panel went on about how Sailor Moon is a “moron.” I’m almost afraid to hear what Feminist Frequency has to say if Sailor Moon got in her hands. 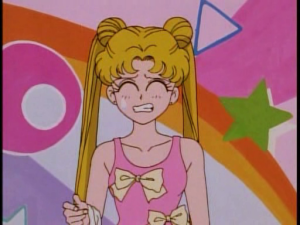 There’s much criticism to Serena / Usagi’s character. Memes and Tumblr posts point out that she’s dumb, stupid, superficial, etc. 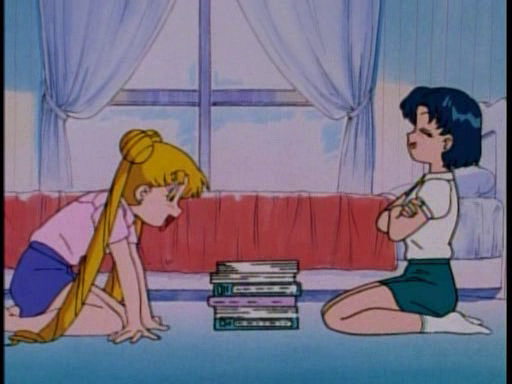 Such arguments would lead to Sailor Moon seen as counterproductive to strong women in children’s media. 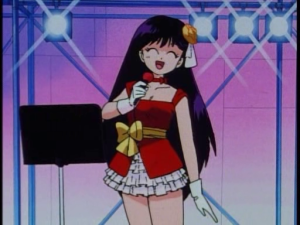 However, I’d argue that Sailor Moon’s strengths are not from her fighting abilities and tossing her tiara around, but rather, who she is as both Serena / Usagi and Sailor Moon. Every tween gal has that “swimsuit body” nightmare. What some of these criticisms are forgetting are that Serena / Usagi is your typical 14 year old girl. She has a lot to learn and also suffers the same insecurities as a young adolescent girl. She worries about weight, physical appearance, fashion, and has the same type of selfishness a tween would have. A lot of this is seen in season one. Doug Walker does point out that the Negaverse / Dark Kingdom likes to attack places that exploit teenage superficiality – singing contests, jewelry stores, etc. Somehow in the plotline, the girls are enamored by McGuffin of the Day and will later on beat Monster of the Day. I don’t think this is a bad thing. Each of the girls in season one has traits and qualities that a lot of young girls can relate to. 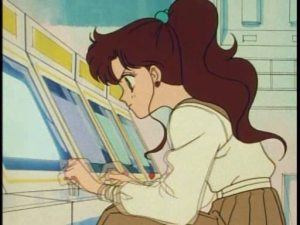 Ami / Amy has high ambitions; she takes herself seriously, but she also feels alone without a friend until Usagi and Luna befriend her. If you notice later on in the series, she actually calls Rei and Usagi out whenever they argue. Rei / Raye is brought up in a conservative and spiritual type of environment, but wants to explore mundane and material things, but still keeping true to her Shinto roots. 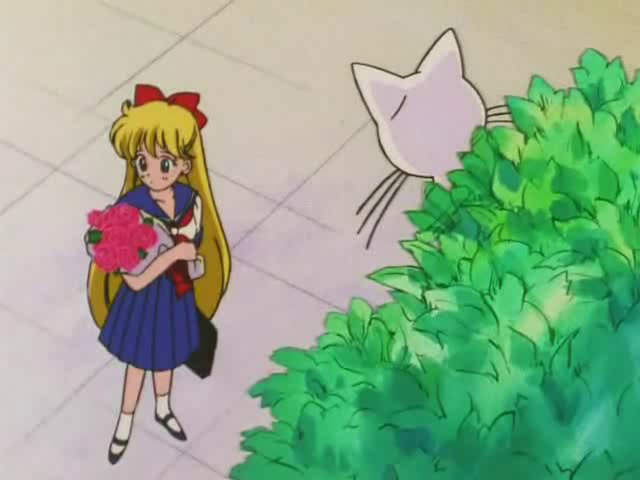 I’ve always felt that Sailor Moon was always about Serena / Usagi’s journey growing up past these teenage flaws – after all, she does have a pink haired spore to look after. 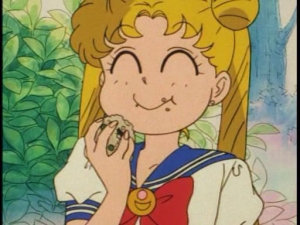 I’d rather have someone as human as Usagi than someone as an inane Mary Sue like Bella Swan. Girls just wanna have lunch! Mako-chan / Lita is a strong independent woman, appetite for achievements, not controllers. After learning an important lesson about the friendzone, Mina learns that cats will always love you. 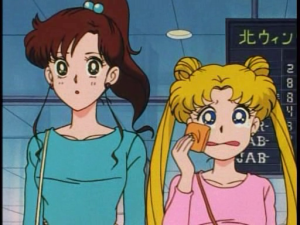 Another argument is that it’s always the other senshi / scouts looking after Usagi / Serena. Critics say the rest of the girls do all the work for her. This is not true. One of my favorite moments in season one is when Ami / Amy hands her a pile of sewing books and kindly tells Usagi / Serena to sew her own bridal gown. 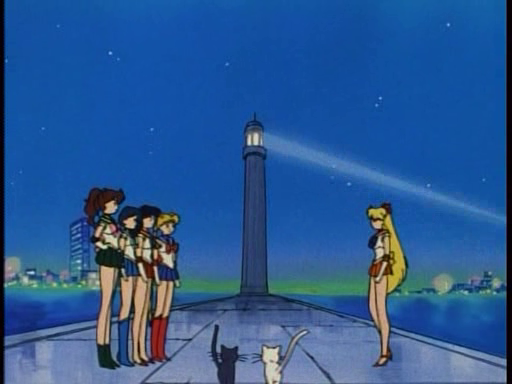 One of the themes of Sailor Moon is working as a team. Her friends keep her in line. True friends will call you out when you are showing your worst. Mars and Moon have an argument on who should be leader. 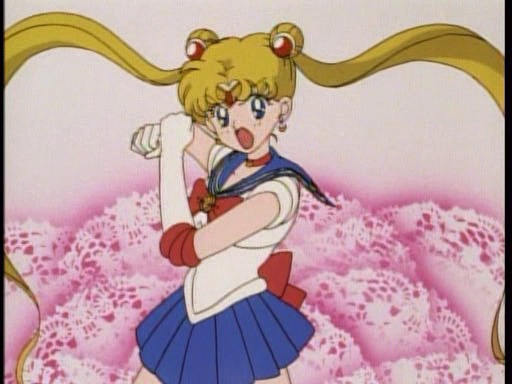 While Mars does have the go-getter personality, Moon has the heart. In the end, they all learn that they need to work as a team to fight the evil forces of chaos. Teaching kids the value of teamwork is always a good thing to have in a kid’s show. While Sailor Moon does the final move (most times to “heal” the Monster of the Day so they can turn back to normal), it’s a team effort. Tuxedo Mask never gets the finishing move. One can argue he’s like the Starfire of the series; he inspires and motivates our main heroine to save the day. 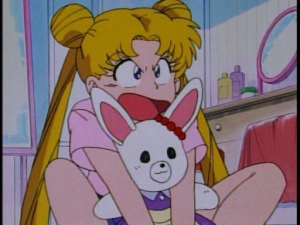 Sailor Moon finishes off the villain without hesitation. While Moon is weak in the beginning, remember, she’s been thrown into ring out of nowhere. She, has no idea what to do. She eventually learns to get over this, and it takes time. This type of development does not happen over night. I were 14 and I found a monster terrorizing Del Amo Mall, I’d be scared too. People make this argument with Shinji in Evangelion. The difference is that Usagi / Serena changes through the series, but Shinji is still an emo putz at the end of the of the world. More importantly, we have to determine how we define “strong female characters.” People often mistake “strong” for the physical attributes. At the New York Comic Con Fables panel, a new artist to Bill Willingham’s team talked about how there were no strong female characters in Fables. I don’t think he’s read any of past Fables – Cinderella is a female James Bond and Snow White has political power by duty. 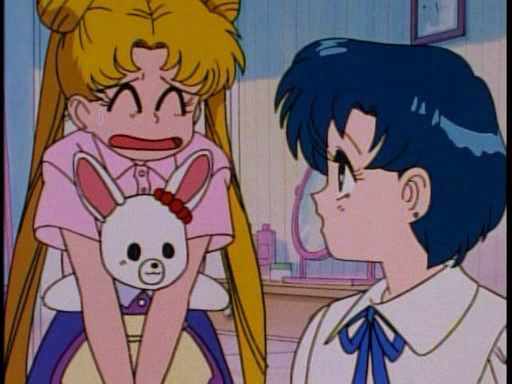 Serena / Usagi may not be the brightest student, but you cannot deny she has emotional and moral intelligence. Much of this is seen in the third season when Moon and Uranus go head to head on how they believe the world should go on. The season could have ended at Mistress Nine’s death – victorious battle and happily ever after. 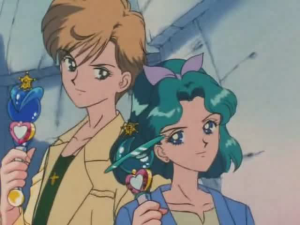 However, season three is not resolved until Moon has to teach Uranus about love and justice. Even when she thought Rini / Chibiusa was a major fungus (unaware it was her daughter), she protected her during the “She’s Got the Power” fight. Sailor Moon strength is that she’s caring and sympathetic towards others. 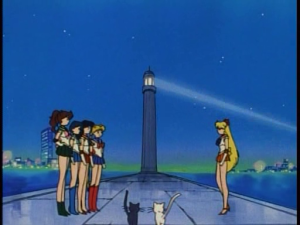 It’s also fairly clear in season one that Sailor Moon will defend and save people she’s barely met. It shows that her loyalty to others is strong. This is a heroine that will never give you up or let you down. 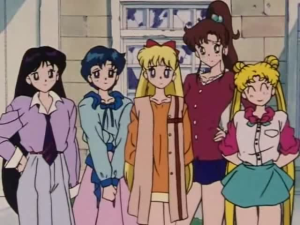 Even Usagi / Serena reached out to be friends with the new girl, despite rumors about her. How many of you would defend someone who’s freeloading at your house and being handsy with your boyfriend? I’m fine if Sailor Moon or magical girl shows that follow Monster of the Day formula is not your thing. There are many incarnations of the Sailor Moon series – manga, anime, musical, live action, etc, but the heroine, Sailor Moon, stays the same. She can be pretty while fighting evil by moonlight, and a total dork when she’s having donuts by daylight. She may have low test scores, but when did our SAT scores define our personalities? I enjoy characters that have mundane flaws, Usagi / Serena’s imperfections also makes up who she is. She’s a normal 14 year old girl who’s still in school. She’s a bit bratty and a crybaby, but she’s actually a champion of justice, Pretty Solider Sailor Moon. and who says we can’t be pretty while saving the world ? 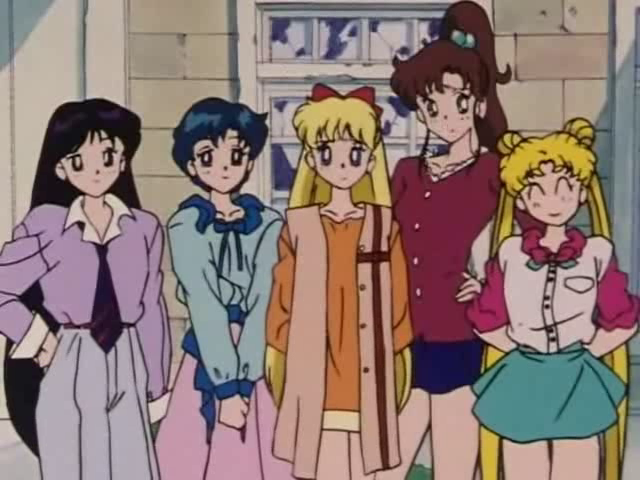 As a 12 year old girl searching for fandom, particularly one that had heroines at the fore front, Sailor Moon was different. I was overwhelmed by amount of Lady Death’s, Vampirella’s, Barbie’s, etc comics at my shop, I couldn’t find something appealing. Sure the Power Rangers had Trini and Kim and the Animaniacs had Dot, but nothing in American media had a heroine team. In retrospect, no one piece of media is ever perfect (ie: the manga has a ton of character development flaws), but the sailor suited team left a very prominent mark in my childhood – at last, girls that I can relate to and buy all the toys for!